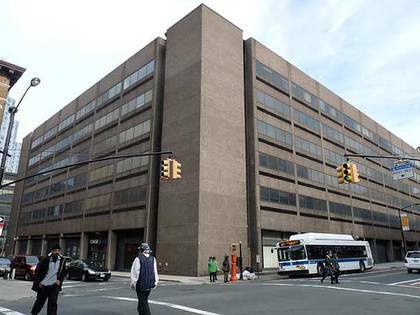 Downtown Brooklyn is the commercial strip along Fulton St. and Livingston St. between Boerum Pl. and Flatbush Ave. While Manhattan’s “downtown” is generally called the “Wall Street area” or “The Battery,” Brooklyn’s commercial strip has never actually had a real name; my parents always referred to it as “downtown” when we took our periodic jaunts on the B37 bus down 3rd Ave. from Bay Ridge to Fulton St. It’s surrounded on the west by Brooklyn Heights, the south by Boerum Hill, and east by Fort Greene. Fulton St. has changed lately, as the Fulton Mall, instituted in 1979, has undergone a remake with curved, Dystopian-looking light poles and updated signage and shelters. It was frozen in time for about 30 years. The stores are still the same, though, affordable for the residents of bordering neighborhoods such as Gowanus and Bedford-Stuyvesant—Fulton Mall hasn’t been totally upscaled, though there has been some luxury encroachment, as high rise apartment houses have sprouted on the surrounding streets. Fulton, Willoughby and Livingston St.’s shops still reflect a clientele that couldn’t afford the rent there, though, and I hope they always do. Adolph I. Namm’s dry good store originated in Manhattan in 1876 and moved to Brooklyn in 1896. By 1924, his son Benjamin Harrison Namm was running the show, and this fine curve-cornered department store went up here between 1924-1929. The outlines of “A.I. Namm and Son” can still be seen on the Fulton St. side. The architects were Robert D. Kohn and Charles Butler. Namm’s later united with rival Loeser’s, and in 1957 was snapped up by Federated/Abraham & Straus, which in turn was renamed Federated/Macy’s in the 1990s. Given that the architects were Kohn and Butler, the mystery for me is the name T.H. Von Deilen, which appears on the curved corner on Hoyt above the Modell’s sign. Who could that have been? It's just another beautiful Beaux Arts building on Willoughby and Lawrence, right? Exuberantly handsome though they may be, many busy shoppers and neighborhood residents usually pass these type of buildings right by. But a closer look pays off. 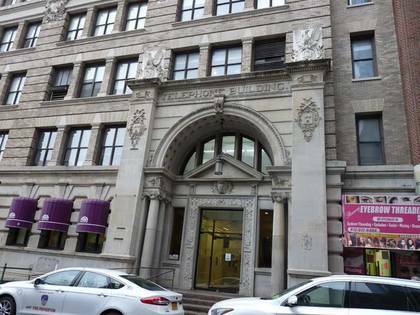 The “TC” carved above the door stands for “Telephone Company.” This used to be the New York and New Jersey Telephone Company Building, built in 1898. What architect Rudolph. I. Daus cleverly did was carving telephones all over the building, the old-fashioned 1898 type, when you had to have the operator put the call through for you. The building’s rounded corner makes it appear to be sailing up Willoughby St. like a magnificent ocean-going vessel. The building contains many cartouches (scroll-like ornaments) and arched windows just below the roof and a porthole window is accentuated by a portrait of Mercury. There had been a whole row of small, brick and wood-framed buildings from 223-235 Duffield St. between Fulton and Willoughby believed to date to the Civil War era and were further believed by their owners to be former homes of abolitionists, if not stops on the Underground Railroad, as was the nearby 1846 First Free Congregational Church, later the African Wesleyan Methodist Episcopal Church on Bridge St. south of Johnson St. in MetroTech Center. Preservationists had hoped to save these buildings, but the city seized them by eminent domain and razed all but one, 227 Duffield, the former homes of abolitionists which survived as a survives as a museum dedicated to the Underground Railroad, Thomas and Harriet Truesdell, though I didn’t see much activity on a recent visit, as yellowed signs faded in the window, along with a portrait of Underground Railroad conductor Harriet Tubman. The only other reminder of the Railroad is a street sign at Fulton and Duffield marking the block as Abolitionist Pl. Abraham & Strauss began in 1865 as a partnership between dry-goods salesmen Joseph Wechsler and Abraham Abraham and, after they moved to Fulton St., by then under an elevated train, in 1885, Wechsler & Abraham was believed to be the largest dry-goods store in New York State. Between 1893 and 1920, Abraham was in partnership with the Strauss family of Macy's fame, which bequeathed the store a new moniker. In the 1990s, A&S was folded into Macy's under the Federated Department Stores banner. As Abraham and Straus grew in the early 20th Century, it acquired buildings on Fulton and built new ones on Livingston like this 1925-1931 Art Moderne classic. 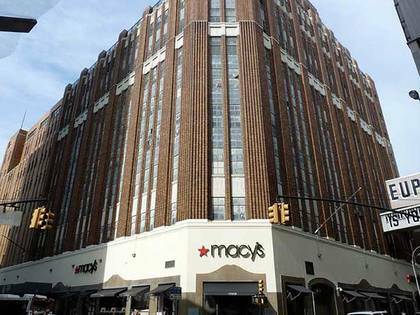 The present Brooklyn Macy’s is now an amalgamation of eight buildings! I’ve mentioned my frequent trips to A&S with my parents before. It’s awhile ago now, but I think that while my mother and I trundled between departments, my father escaped to Willoughby St., where there was a camera shop at Lawrence; there, he felt more at home. After over 40 years I don’t recall a lot about the A&S jaunts, except for the terrific elevators, which were operated manually by an attendant, who’d pull a laver back and forth to make the doors open and close. I think I spent time in their kids’ book department, and I also remember a rather sophisticated restaurant (not a lunch counter like Woolworths). The best part of my journey was riding the B37 3rd Ave. bus, where I studied carefully everything that went past us out the window. In the late-1960s, our A&S jaunts were curtailed because E.J. Korvette’s opened a branch on Bay Parkway at the waterfront, and all we needed to do was take the B64 bus for 20 minutes. The space is now occupied by a mall anchored by Modell’s, Kohl’s, and until recently, Toys “R” Us. What’s likely the most impressive building in Downtown Brooklyn is what used to be Dime Savings Bank, seen here looking north on Elm Pl. The building features bas reliefs of the Brooklyn Bridge and the Roman god Mercury on the exterior, and large gilded versions of Liberty dimes inside. It was built in 1908 and expanded in 1932. Since the Liberty dime was first minted in 1916 (and lasted until 1945, when the Roosevelt Dime took over) they were likely added after that year. 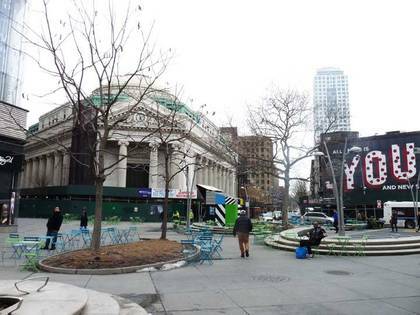 Until recently the dome hosted a Chase bank, but it’s currently under refurbishment—thankfully, its landmarked status prevents its being totally altered. The Ministry of Love, actually Consolidated Edison headquarters, stands in a triangle formed by Nevins, Livingston and Flatbush Aves. There’s an architectural genre called Brutalist, and this is Brutalist at its worst, from the dark and distant time that was early-1970s building design. 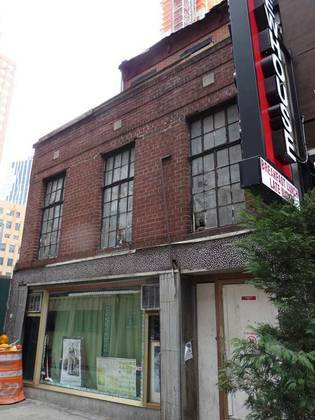 Before the Con Ed HQ was built, this plot was home to the Fox Theatre between 1926-1971, occupying the bottom floor of a large office building. Toward the end of its run on Flatbush Ave. in the mid- to late-1960s, WINS DJ Murray the K brought package rock and roll tours to the Fox. The Who and Cream made their NYC concert debuts at Murray the K shows. Livingston has some vintage signs of a previous age. An outfit named Pomeroy formerly sold trusses, elastic stockings, abdominal belts and artificial legs. 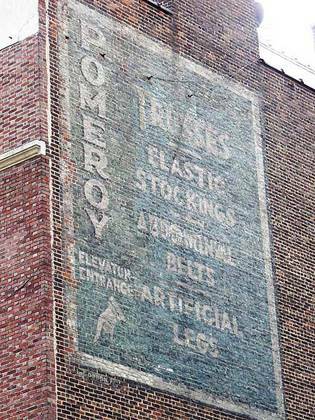 Between the 1830s through 1930s, Pomeroy was a prominent maker of “surgical appliances” in New York City. “The Pomeroy Surgical Corset” promises to cure various ailments, including those where your internal organs start sliding below their normal position, i.e. a hernia. Many of the older painted signs for surgical appliances and medications you see in NYC were sponsored by quacks of varying degrees.